One of my favorite parts of spring is watching the bees come back to the garden, foraging for the nectar and pollen they need for their hives. 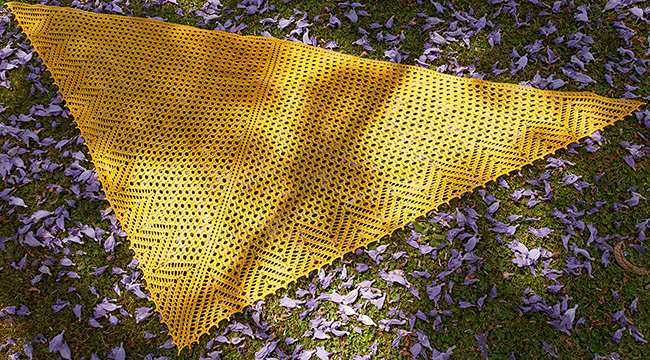 This sunny yellow shawl is inspired by honeycomb and sweet flowing honey. 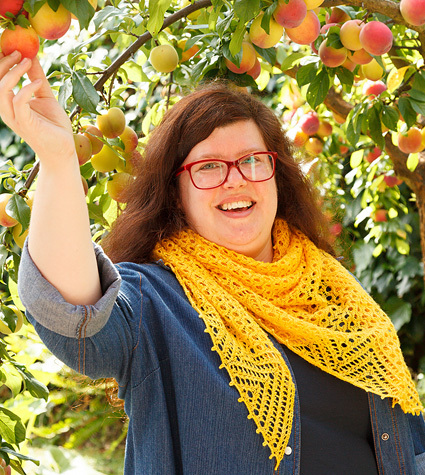 Knit in a soft laceweight yarn, Liquid Honey is light and delicate. Its structure is a traditional top-down triangle, beginning with a garter tab cast on. 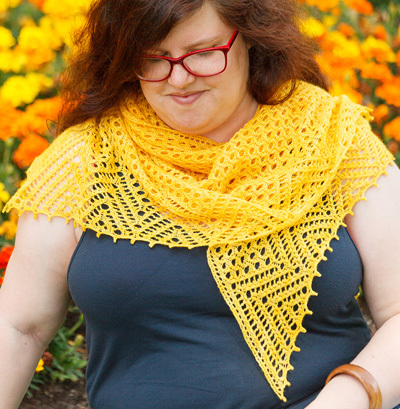 The body of the shawl is covered in honeycomb lace that is intuitive to knit, formed with double yarn-overs and simple decreases. 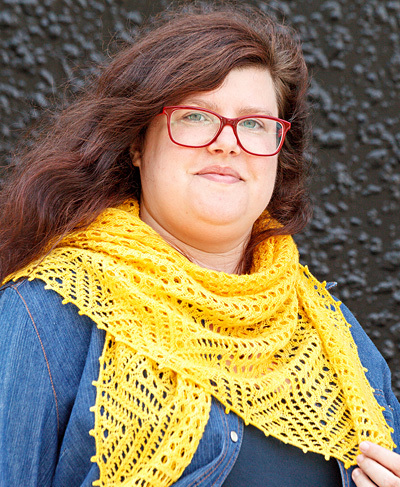 The honeycomb flows downwards into a zigzagging lace border and a picot bind-off. The effect is of liquid honey dripping from golden honeycomb. Needles with sharper tips make the edging easier to work (I used Addi Lace). 8 stitch markers are needed. 4 are placed in Setup Row 1, and the remaining 4 are placed in Transition Row 14. Row 1 [RS]: Yo, k1, (k2tog, yo twice, ssk) to 1 st before marker, k1, yo. Row 2 [WS]: P4, (k1, p3) to marker. Row 3 [RS]: Yo, knit to marker, yo. Row 3 [RS]: Yo, k1, (k2tog, yo, k2, yo, ssk, k14) to 7 sts before marker, k2tog, yo, k2, yo, ssk, k1, yo. Row 5 [RS]: Repeat Row 1. Row 6 [WS]: Repeat Row 2. Row 7 [RS]: Yo, k1, [(k2tog, yo twice, ssk, k2) twice, k8] to 11 sts before marker, k2tog, yo twice, ssk, k2, k2tog, yo twice, ssk, k1, yo. Row 8 [WS]: P4, k1, p5, (k1, p13, k1, p5) to 4 sts before marker, k1, p3. Row 9 [RS]: Repeat Row 1. Row 10 [WS]: Repeat Row 2. Row 11 [RS]: Yo, k1, (k2tog, yo twice, ssk, k2tog, yo, k2, yo, ssk, k2tog, yo twice, ssk, k6) to 15 sts before marker, k2tog, yo twice, ssk, k2tog, yo, k2, yo, ssk, k2tog, yo twice, ssk, k1, yo. Row 12 [WS]: P4, (k1, p9) to 4 sts before marker, k1, p3. Row 13 [RS]: Repeat Row 1. Row 14 [WS]: P4, k1, p3, k1, p1, pm, p2, (k1, p3) to 12 sts before marker, k1, p1, pm, p2, (k1, p3) to marker. Note: If you work from chart, the Edge Repeat is worked twice the first time through the 8 rows, three times the second time through, and four times on the final set of rows. Row 1 [RS]: Yo, k1, (k2tog, yo twice, ssk) to 1 st before first marker, k1, *k1, (k2tog, yo twice, ssk) x 2, k2, (k2tog, yo twice, ssk) x 2, k1; repeat from * to second marker, k1, (k2tog, yo twice, ssk) to 1 st before spine/end of row marker, k1, yo. Row 2 [WS]: P4, (k1, p3) to 3 sts before first marker, k1, p2, p3, (k1, p3, k1, p5) to 7 sts before second marker, k1, p3, k1, p2, p3, (k1, p3) to spine/end of row marker. Row 3 [RS]: Yo, k1, (k2tog, yo twice, ssk) to 1 st before spine/end of row marker, k1, yo. Row 4 [WS]: P4, (k1, p3) to spine/end of row marker. Row 5 [RS]: Yo, k1, (k2tog, yo twice, ssk) to 3 sts before first marker, k2tog, yo, k1, slip marker, (k1, yo, ssk, k2tog, yo twice, ssk, k2tog, yo, k1) to second marker, k1, yo, ssk, (k2tog, yo twice, ssk) to 1 st before spine/end of row marker, k1, yo. Row 6 [WS]: P4, (k1, p3) to 1 st before first marker, p1, p5, (k1, p9) to 5 sts before second marker, k1, p4, p5, (k1, p3) to spine/end of row marker. Row 7 [RS]: Repeat Row 3. Row 8 [WS]: Repeat Row 4. Sl-L: Slip the stitch just worked back to left-hand needle. CO 2 sts using the Long Tail method, then knit 12 rows in garter stitch. Do not turn. Pick up and knit 6 sts from the side of your work, picking up 1 st in each garter ridge. Finally, pick up and knit 2 sts from your CO edge. 10 sts. Next Row [WS]: (K2, p2) twice, k2. Row 1 [RS]: (K2, pm, yo, k2, yo, pm) twice, k2. 14 sts. Row 2 [WS]: (K2, p4) twice, k2. Row 3 [RS]: (K2, yo, k4, yo) twice, k2. 18 sts. Row 4 [WS]: (K2, p6) twice, k2. Row 1 [RS]: K2, work Body Pattern to spine marker, slip marker, k2, slip marker, work Body Pattern to last 2 sts, k2. 4 sts increased. Row 2 [WS]: K2, work Body Pattern to spine marker, slip marker, k2, slip marker, work Body Pattern to last 2 sts, k2. Continue as set until you have worked the 4-row repeat of the Body Pattern 40 times total. 338 sts. Row 1 [RS]: K2, work Transition Pattern to next marker, slip marker, k2, slip marker, work Transition Pattern to last 2 sts, k2. 4 sts increased. 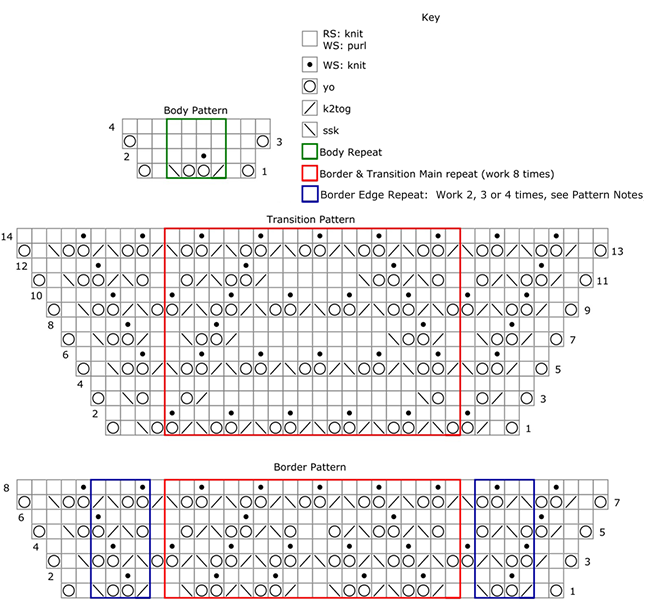 Continue as set until you have worked all 14 rows of the Transition Pattern. 366 sts. Row 1 [RS]: K2, work Border Pattern to spine marker, slip marker, k2, slip marker, work Border Pattern to last 2 sts, k2. 4 sts increased. Row 2 [WS]: K2, work Border Pattern to spine marker, slip marker, k2, slip marker, work Border Pattern to last 2 sts, k2. 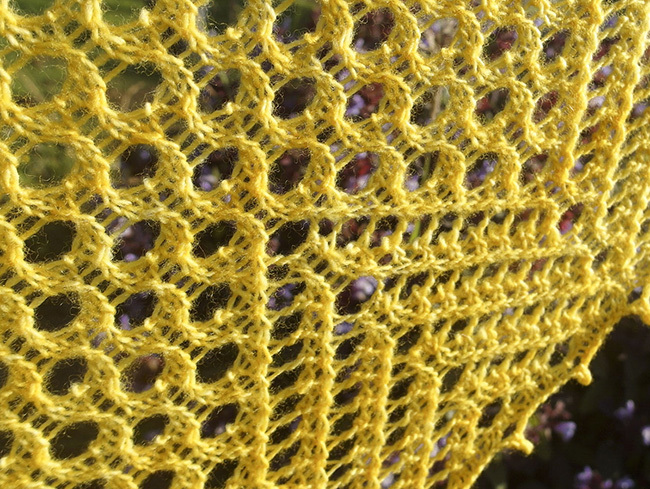 Continue as set until you have worked all 8 rows of the Border Pattern twice in full, and Rows 1-6 of a third repeat. 410 sts. Final Row [RS]: K2, slip marker, yo, k to marker, yo, slip marker, k2, slip marker, yo, k to marker, yo, slip marker, k2. 414 sts. Note: A few picots at each end and at the center of the bind off are 1 st closer together than the rest. When working BO6 and BO7, keep track by counting each stitch you lift over. Work across as follows: K1, (sl-L, CCO2, BO6) twice, (sl-L, CCO2, BO7) to 7 sts before marker, (sl-L, CCO2, BO6) 4 times, (sl-L, CCO2, BO7) to 9 sts from end of row, (sl-L, CCO2, BO6) twice, sl-L, CCO2, BO3. Weave in the ends, and wet block your shawl. If using blocking wires, thread them through each picot in the bind off. Allow to dry completely. Amy is a 36-year-old Kiwi living in Melbourne, Australia. Her obsessions include knitting (surprise! ), singing, Baroque music, taking photos, cheap and delicious food, bees, nature, and admiring beautiful yarn and fiber. 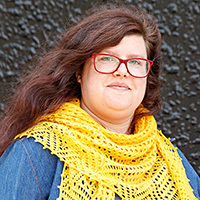 You can find Amy on Ravelry and at her blog, Baroque Purls.